Herbs, annual or weakly per-ennial, 4-30 dm. 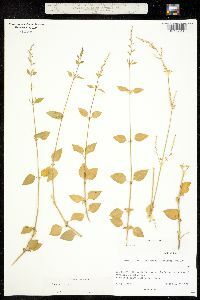 Stems erect, spreading, or clambering, much-branched, glabrous or sparsely villous. 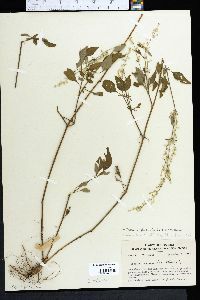 Leaves opposite; blade ovate to lanceolate, 3-14 × 1.5-7 cm, glabrous or villous. 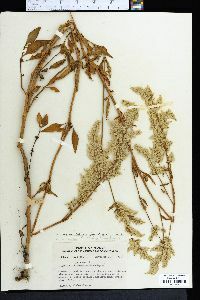 Inflores-cences: panicles, 10-40 cm; bracts and bracteoles 1/3-2/3 as long as tepals. Flowers pedicellate; tepals whitish to stramineous, oblong, 0.6-0.8 mm, hyaline, apex obtuse or rounded, densely villous. Utricles included in tepals, greenish, ovoid, 0.6-0.8 mm, apex obtuse. Seeds 0.5-0.7 mm. Flowering fall. Hammocks, marshes, other habitats mostly near coast; 0-10 m; Fla., La., Tex. ; Mexico; West Indies; Central America; South America.